How fast do deep-sea corals grow? As usual with questions pertaining to biology, the answer is "it depends." Just like terrestrial organisms, coral growth rates are influenced by a number of factors. Each species has a genetic "blueprint" that defines its growth capacity, but environmental conditions, food intake, and stress contribute to the actual growth of an individual. 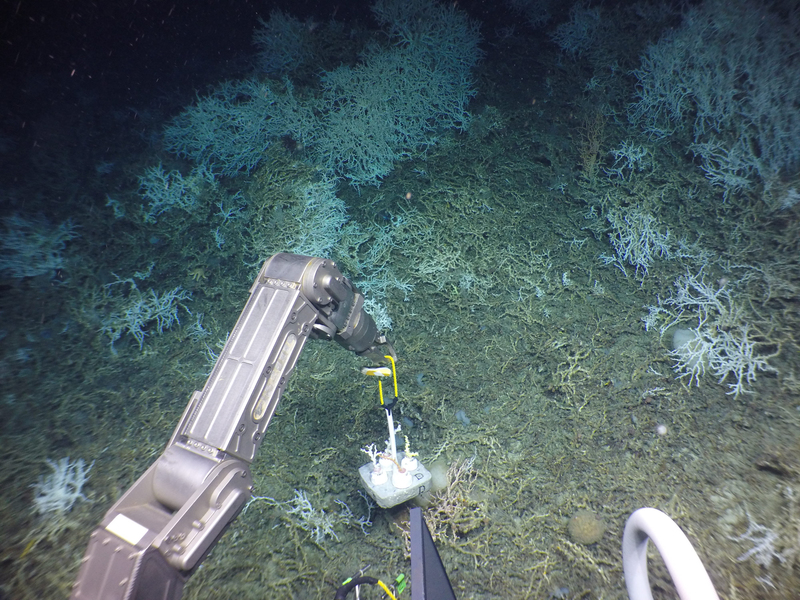 In remote places like the deep sea, that are difficult and expensive to access, most growth measurements are done indirectly using a number of different methods. Large tree-like corals lay down growth rings, just like trees. These rings can be counted to provide colony age and growth estimates. The dominant deep-sea coral in our study region is Lophelia pertusa, a branching stony coral which forms massive reefs from the Carolinas to south Florida. This species does not have a regular growth form like a tree, so it is harder to analyze. Colonies of Lophelia growing on artificial structures, such as shipwrecks, can be measured and growth rates estimated from the date the structure was deployed. Laboratory studies have measured the growth of Lophelia and other stony corals maintained in aquaria, but such information may not represent natural growth rates, as we cannot accurately replicate deep-sea conditions. During this cruise, we are trying another approach to measure growth rates of three different species of branching stony corals: Lophelia pertusa, Enallopsammia profunda and Madrepora oculata. 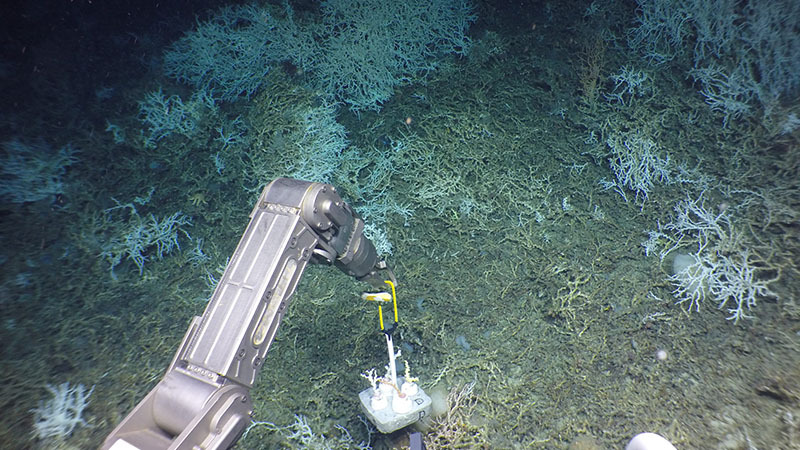 We collected fragments of our target corals from a site called Richardson Ridge, which is 160 miles off the coast of South Carolina at 800 meters depth. On August 23, we collected fragments of coral using the Alvin submersible and brought them to the surface in sealed containers to keep them at deep-sea temperature. I spent that evening in the cold room, attaching the fragments to PVC fittings and photographing them from every angle around the perimeter. These images will be compiled to make a 3D model of each fragment, which can be used to measure their dimensions. 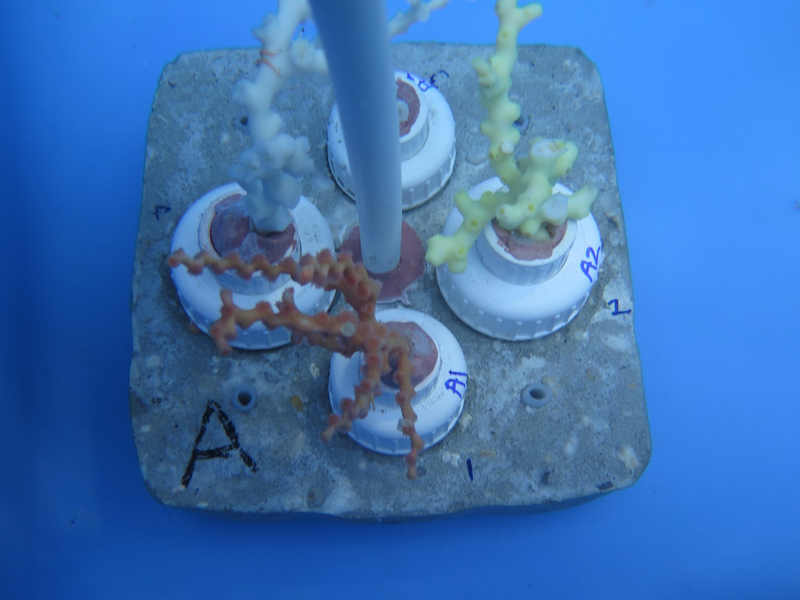 This image of one of the coral experimental units shows fragments of Enallopsammia (yellow, right), Madrepora (orange, front), and Lophelia (white, left) with a small brittlestar still clinging to its branch after all the processing. Image courtesy of DEEP SEARCH 2018 - BOEM, USGS, NOAA. Download larger version (jpg, 456 KB). 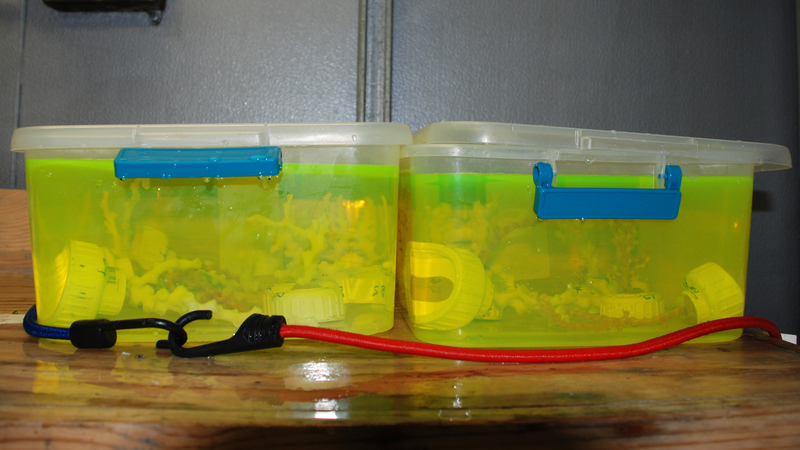 The fragments were then left overnight in a bath of Calcein—a non-toxic fluorescent dye that is incorporated into the coral skeleton. Just before the Alvin dive the next day, the corals were mounted on cement bases and placed back in the biobox for their trip back to the seafloor. Lophelia pertusa, Enallopsammia profunda and Madrepora oculata fragments were stained overnight in a bath of Calcein, a non-toxic fluorescent dye that incorporates into the coral skeleton and help scientists to directly measure growth rates when the coral is returned to the seafloor. Image courtesy of DEEP SEARCH 2018 - BOEM, USGS, NOAA. Download larger version (jpg, 2.1 MB). The experiment has been returned to the seafloor and will be collected next year when we return. Image courtesy of DEEP SEARCH 2018 - BOEM, USGS, NOAA. Download larger version (jpg, 5.1 MB). We will collect these corals during our research cruise next year and measure how much they have grown during that time. The fluorescent stain band will tell us where the coral growth centers are and how much skeleton has been added to each branch, and the differences between the before and after 3D models will give us a volume increase over time. There are still artifacts associated with this approach—we may not place them exactly in the best spot, or they may be stressed from handling, but the simultaneous comparison of three different species will provide some valuable insight into how these important species function.